It’s only a little over a month until MSC Divina arrives in Miami, her new year round home. There are lots of cruises out of Miami, but MSC obviously is going to be seeking to differentiate themselves. In some ways, that will be easy. MSC already has a distinctive style about almost everything. One of the ways though they seem to have added, is that they are targeting repeat cruisers who will cruise several times each year. The way they are doing that is by making portions of the product different each time you cruise, not like some lines where if you cruise this week and go back on the same ship six months from now, it will be exactly the same cruise. CND subscribers also read about passengers who just happened to hear something ... and more about a big lift. On October 10 (2013) Costa contracted with Boskalis for availability of Dockwise Vanguard during the summer of 2014 to lift and carry the wreck of Costa Concordia to a shipyard where it will be dismantled. This video shows how it would happen. At this point, Costa has only contracted for the availability of the ship, which is the largest of its kind, and it is just an option that is being considered over this winter in case the ship cannot be safely towed as was originally planned once it is refloated. 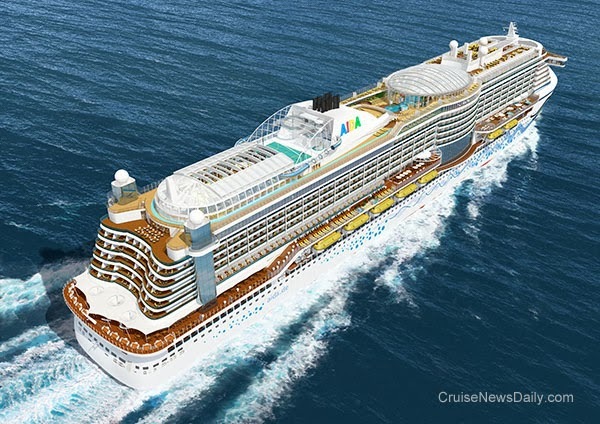 The complete story appeared in the October 10, 2013, edition of Cruise News Daily. There have been two developments in recent days with respect to the now-righted wreck of Costa Concordia. CND subscribers also read about New Orleans being ready to receive their Jewel ... Princess was very pleased ... and a new operator at Brooklyn. Carnival's German brand, AIDA, began releasing details yesterday of AIDAprima which will be delivered by Mitsubishi in March 2015. 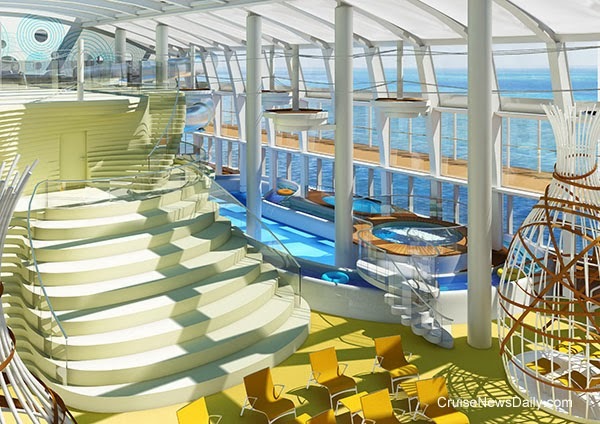 Some of their most innovative passengers features will be on the ship's top deck. One thing to note in this rendering is that most of the top deck is covered by a retractable dome of a thin membrane which is UV-penetrable, making the facilities warm and usable year round, even during the inclement weather of winter in Northern Europe. This is important since AIDAprima will be homeported at Hamburg year round. The Beach Club will take up the midships part of the top deck. AIDA has a beach theme around their pools as can be seen in the rendering. 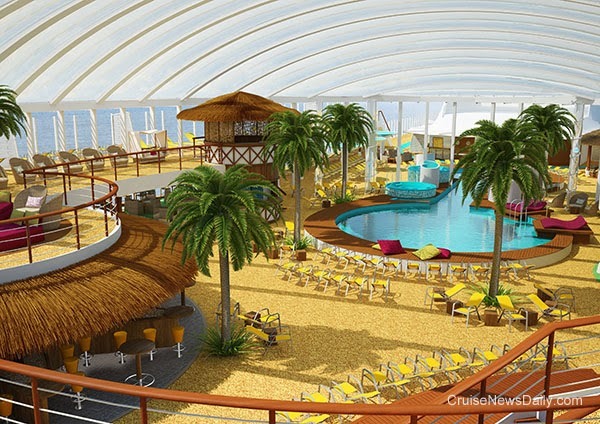 Note the large Beach Club Bar in the lower left. The area will also be used for beach parties at night, and when the dome is closed, a virtual starry night can be projected on the membrane, or it can be used as a screen for a laser light show. The fun in the sun under the UV-penetrable dome will continue on the aft part of the top deck where passengers will find a climbing wall, sports court, and large LED screen for sporting events. 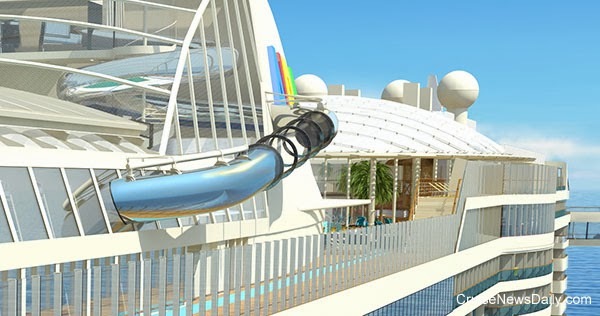 One of the innovative features on AIDAprima will be the Lazy River which winds through the area allowing passengers to float along with the current at their own pace. AIDAprima will also give passengers a thrill on a Skywalk that extends out over the sea about 145 feet below. 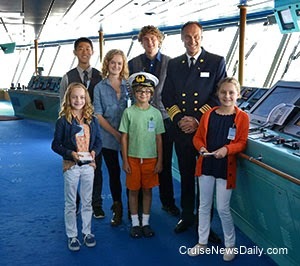 The complete story appeared in yesterday's edition of Cruise News Daily. In addition to releasing some major details of the ships’ features this week, they also announced that the first, when it’s delivered in March 2015, will be named AIDAprima. CND subscribers also read about an Asian Celebrity ... and Disney "wonders" about Jamaica. Seattle, Wash., Oct. 9, 2013 — Holland America Line has promoted Cyril Tatar to vice president, newbuilding and Seabourn technical operations. In this role, he will be the principal liaison to the shipyards for design and coordination of current and future newbuilds for both the Holland America Line and Seabourn fleets, including the Holland America Line Pinnacle Class ship due for delivery in February 2016. Additionally, Tatar will continue to lead technical support and services for Seabourn. Tatar will report to Dan Grausz, executive vice president, fleet operations. Most recently Tatar was director, technical operations for Seabourn. He joined Holland America Line in 2004 as a contractor on the Signature of Excellence retrofit team, and in October 2006 he was employed as a technical operations manager, continuing work on various large retrofit projects. In 2008, Tatar was put in charge of all of the Signature of Excellence retrofits as deputy director, where he spent time at the shipyards ensuring the projects were completed on time and within budget. He has also served as project manager consultant for Cunard Line where he worked on the Queen Elizabeth 2, and as a consultant to Windstar Cruises prior to its sale by Carnival Corporation. His career also includes stints at Alstom Marine and Chantiers de L'Atlantique – where he served as a design engineer as well as a project engineer for Celebrity Cruises, Festival Cruises, Renaissance Cruises, Princess Cruises and Cunard Line. Tatar holds a Bachelor’s of Applied Science and a Master of Science in Engineering from the Université de Nantes. He also studied naval architecture and marine engineering at Ecole d'Architecture de Nantes, and financial operations and logistics support command at French National Military Academy of Saint-Cyr. October 9, 2013, Brussels - CLIA Europe Chairman, Manfredi Lefebvre d’Ovidio, announced that he will complete his term as Chairman of CLIA Europe at the end of the year. He will be succeeded by CLIA Europe Vice-Chairman, Pierfrancesco Vago, Executive Chairman of MSC Cruises. Lefebvre d’Ovidio served as Chairman of CLIA Europe for three and a half years, which included an extension at the request of CLIA Europe members. He will remain a member of CLIA’s Global Executive Committee. “I wish to acknowledge Manfredi Lefebvre d’Ovidio for his exceptional leadership in Europe, and extend to him my gratitude on behalf of all CLIA members, particularly for agreeing to serve for an extended period. His close working relationships with regulators and fellow industry colleagues, in particular with his successor, CLIA Europe Vice-Chairman Pierfrancesco Vago, will ensure a smooth and seamless transition. “I am delighted that CLIA Europe Vice Chairman Pierfrancesco Vago, a member of CLIA’s Global Executive Committee, will succeed Manfredi Lefebvre d’Ovidio starting on 1st January next year. In his role as Chairman of MSC Cruises Pierfrancesco Vago has already made a tremendous contribution to the growth of the cruise industry in Europe. Manfredi Lefebvre thanked Christine Duffy for her leadership and welcomed his successor Pierfrancesco Vago. He also thanked fellow industry colleagues for their support, the teams in each of the CLIA Associations across Europe and outlined his confidence in the future of the industry. “The cruise industry continues to make a strong economic contribution to the European economy and has shown robust growth in the past decade, even in the face of economic downturns. I’m confident this success will continue and I am also confident CLIA Europe will continue to thrive under the leadership of my successor, Pierfrancesco Vago,” Lefebvre d’Ovidio said. “It is an honour for me to take on the role as Chairman of CLIA Europe. Manfredi Lefebvre d’Ovidio has been an extraordinary Chairman and will be a hard act to follow,” Mr. Vago said. He has left a strong and positive legacy which I aim to build on. In particular he has built strong relationships with governments and regulators, most notably the European Commission and European Parliament, contributing significantly to the development of the positive and credible reputation the industry enjoys today. 1. Manfredi Lefebvre d’Ovidio is Chairman of Silversea Cruises, part of the Lefebvre family investment portfolio, and is one of the most experienced cruise executives in the world. He is also Member of the World Economic Forum, Vice-Chairman of the World Travel & tourism Council. In 2007 he was appointed Chevalier de l'Ordre de Saint Charles and Grimaldi, a title received by His Serene Highness Albert II, Prince of Monaco. 2. Pierfrancesco Vago is Executive Chairman of MSC Cruises and served as its Chief Executive Officer from 2004 until September 2013, overseeing the company’s unprecedented growth from its Geneva-based headquarters. He is leading the company’s expansion alongside MSC Cruises CEO Gianni Onorato, while overseeing all subsidiaries of the MSC group with a strategic relevance to the tourism sector. He started his career in the MSC group by leading the joint venture between the Italian Ferry company SNAV and Hoverspeed Seacontainer Group, the leader in fast connections on the Adriatic Sea. In 2001 Vago was promoted to the position of MSC Cargo Line Manager for the USA, Mexico and Canada, and in 2004, considering the growing importance of the company’s cruise line division, he was appointed CEO of MSC Cruises. In September 2013 he was appointed Executive Chairman. Italian born, Vago began his career in the family business Franco Vago SpA, one of the leading Italian transport companies with affiliates on every continent. 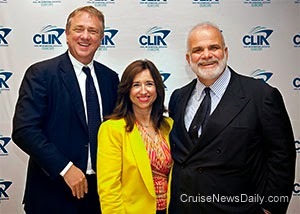 Cruise Lines International Association (CLIA) is the world's largest cruise industry trade association with representation in North and South America, Europe, Asia and Australasia. CLIA represents the interests of cruise lines, travel agents, port authorities and destinations, and various industry business partners before regulatory and legislative policy makers. CLIA is also engaged in travel agent training, research and marketing communications to promote the value and desirability of cruise holiday vacations with thousands of travel agency and travel agent members. CLIA's Associate Member and Executive Partner programs include the industry's leading providers of supplies and services that help cruise lines provide a safe, environmentally-friendly and enjoyable holiday vacation experience for millions of passengers every year. For more information on CLIA, the cruise industry, and CLIA-member cruise lines and travel agencies, visit www.cruising.org. CLIA can also be followed on the Cruise Lines International Association's Facebook and Twitter fan pages, and CEO Christine Duffy can be followed @CLIACEO and cruising.org/ceoblog. • Economic contribution: Europe’s cruising industry generated €37.9bn in total output and €15.5bn in direct spending by the cruise lines, their passengers and crew. • Jobs: The number of fulltime-equivalent jobs generated by the cruise sector in Europe is now well over 325,000 (direct and indirect). • Shipyards: The overwhelming majority of the world’s cruise ships are built in Europe. This year alone our European shipyards are working on 20 new ocean-going cruise ships scheduled for delivery in 2016 and worth over €10 billion. In 2013-14, European shipyards are scheduled to deliver 51 new river cruise ships. • Cruise holidaymakers: The number of Europeans choosing a cruise holiday has more than doubled in the past decade to over 6 million. The number of total cruise passengers that have embarked in Europe has also strongly increased – in 2012, 5.70 million people took a cruise holiday in Europe. Almost a million come from outside of the EU. Seattle, Wash., Oct. 8, 2013 — Holland America Line hosted the last non-profit luncheon of the season at the Port of Seattle Saturday, Sept. 21, 2013, aboard ms Westerdam for the Seattle Children’s Theatre, one of the line’s community partners. Prior to the luncheon, attendees were treated to an exclusive performance in the ship’s main show lounge, highlighting musical selections from SCT’s upcoming holiday production, James and the Giant Peach, by Tony-nominated composers Justin Paul and Benj Pasek. Guests were also treated to a private reading of Art Dog by composer Sue Ennis, and participated in a live auction for a chance to tour the ship’s bridge with the Captain. Seattle Children's Theatre is one of the most prominent theaters for young audiences and among the top 20 regional theatres in the country. Their programs empower young people to make new discoveries about themselves and the world around them while building a lifelong interest in the arts. The mission of Seattle Children's Theatre is to provide children of all ages access to professional theatre, with a focus on new works and theater education. Founded in 1975, SCT started as a program of the Seattle Department of Parks and Recreation with initial funding from the City of Seattle and PONCHO (Patrons of Northwest Civic, Cultural and Charitable Organizations). Since its inception, Seattle Children's Theatre has strived to provide innovative artistic programming and professional theater for the young people and families of the Puget Sound region. SCT moved into the 482-seat Charlotte Martin Theatre in 1993, the 275-seat Eve Alvord Theatre in 1995, and completed the Allen Family Technical Pavilion, which consists of the paint, costume, prop and scene shops as well as rehearsal and classroom spaces, in 2000. This state-of-the-art facility was the first self-contained theater complex built for young audiences in the nation, and has since been used as a model for other theaters. For more information visit, www.sct.org. Norwegian Cruise Line has chosen the names for their two Breakaway Plus ships based on a Facebook contest that the line ran from September 10 to September 24. The two names chosen are Norwegian Escape and Norwegian Bliss. A 73-year-old Australian man is missing from Sun Princess off the western coast of Australia. He was reported missing this morning by his wife as the ship was sailing about 40 miles off the coast of Londonderry. CND subscribers also read about a few more details of a new order from Meyer Werft ... more evidence of why Grand Cayman needs a pier ... and the casinos are still closed. Genting Hong Kong, the parent of Star Cruises and the majority stockholder in Norwegian Cruise Line, said today they ordered a ship from Meyer Werft via their wholly-owned subsidiary, Chinese Dream. Coast Guard medevacs from cruise ships have become somewhat routine. Watching the video of the operations, you can see the tremendous skill of the Coast Guard pilots as they hover over the decks of ships and hoist a patient to the helicopter. Traffic on the Mississippi River returned to normal Sunday with all restrictions lifted after Tropical Storm Karen took a turn to the east and dissipated. The US Coast Guard flew 1,036 miles from Hawaii on Sunday to drop urgently needed blood to Holland America's Oosterdam which was two days away from its destination of Lahaina (Maui). In this video, shot form the back of the HC-130 Hercules aircraft during the drop, note how close the packages are going to land to the waiting tenders from the ship. 9.30 am - Sunday, Oct. 6 -- Carnival Cruise Lines has two ships homeported in New Orleans whose operations have been impacted by Tropical Storm Karen. Given the closure of the Mississippi River, the arrivals of both Carnival Elation and Carnival Conquest to New Orleans were delayed. Both vessels maintained a safe distance from the storm while awaiting the re-opening of the river. Both are now expected to dock at the Port of New Orleans this afternoon. Carnival Elation operates four and five-day cruises from New Orleans and departed on its current voyage, a five-day cruise, on Monday, Sept. 30 that included stops in Progreso and Cozumel, Mexico. The ship was originally scheduled to return to New Orleans on Saturday, Oct. 5. Carnival Elation is now expected to dock in New Orleans at approximately 2pm this afternoon. Guests have the option of disembarking today or remaining on board until tomorrow morning. The Elation’s next voyage will depart on Monday, Oct 7 and has been modified from a five-day cruise to a three-day Fun Cruise at Sea. Guests who opt to proceed with the cruise will receive a 50 percent refund for this voyage and a 50 percent discount towards a future three to five-day cruise. Tomorrow's embarkation for the next voyage is scheduled from 11 am to 3 pm. Carnival Conquest operates seven-day Caribbean and Florida/Bahamas cruises from New Orleans. The ship departed New Orleans on its current voyage on Sunday, Sept. 29 that included stops in Montego Bay, Jamaica; Grand Cayman and Cozumel. Carnival Conquest was originally scheduled to return to New Orleans this morning. The ship is now scheduled to arrive at approximately 1.30p this afternoon. Guests have the option of disembarking today or remaining on board until tomorrow morning. The Conquest’s next voyage will be modified from a seven-day cruise to a six-day cruise with stops in Key West and Nassau, The Bahamas – two of the three originally scheduled ports. Guests who opt to proceed with this cruise will receive a one-day pro-rated refund. Embarkation for tomorrow's cruise departure is scheduled from 10 am to 2 pm. A number of additional staff have been mobilized to join the current team in New Orleans to provide guests with assistance and support. "Our top priority was to keep a safe distance from the storm while we waited for the river to re-open. We are pleased to be able to get our ships back into New Orleans earlier than what was originally anticipated as the storm was moving towards the coastline. We apologize to our guests for the inconvenience caused by Tropical Storm Karen and we extend our appreciation to all of the officials and maritime partners in New Orleans who have worked with us throughout to manage the situation as smoothly as possible," said Gerry Cahill, president and CEO of Carnival Cruise Lines. Guests can receive automatic updates by signing up for text alerts. For updates on Carnival Elation, text CCL1 to CRUISE (278473) and for updates on Carnival Conquest text CCL2 to CRUISE (278473). Updates are also being posted on www.carnival.com.